​Cleaning tile may not be so tough, but getting down into the grout to remove dirt and grime can present a challenge. In order to restore a clean order back in your home, you need to find the best mop for tile floors and grout. There really is no one size fits all when it comes to choosing a mop. Take a look at this guide to see what type of mop fits your needs and what features will make your floor cleaning routine easier. ​Tile floors and grout won't be as hard to clean with the right equipment. Read on below to see our top picks for the best mop for tile floors and grout. The main steam mop has a microfiber pad that will pick up and trap in dirt, dust, and hair as you glide over the floors. When the microfiber pad gets dirty, you can toss it in the washing machine and replace it for your next cleaning session. When it comes to cleaning your kitchen or bathroom tile, you can use the fine detailed attachment for picking up stubborn cooking or urine stains. An attachable hose and cornered handheld steam pad lets you quickly transition to cleaning your upholstery and even mirrors. ​Finally, you can lift off a detachable water reservoir and use it as a handheld steamer for your clothes. A fine nozzle attaches to the water reservoir, so you can concentrate the steam into the fibers of your clothes to fight wrinkles, detour smelly bacteria, and refresh your wardrobe without washing. The built-in water reservoir offers about 20-25 minutes of non-stop steam when it is on the lowest setting. When plugged in, this mop is ready to go within 30 seconds. ​The Light N’ Easy Steam Mop is one of the top brands and has been in business for over 60 years. This mop also comes with a free replacement policy and a one year warranty. We have found it is a great all-in-one solution for cleaning your whole home. ​Lightweight and easy to use, ​this mop is the best all-around steam cleaner for your flooring and upholstery. A must have for the pet friendly home that wants to keep the floors clean and chemicals away from sensitive noses is the Bissell 1544A Powerfresh Lift-Off Pet Steam Mop. This hardworking and pet-safe steamer eliminates pet messes as well as everyday dirt and grime from all your various surfaces without using any harsh chemicals. The two-in-one designs gives you an easy-to-maneuver mop and a lift-away handheld steamer you can use on countertops, windows, and upholstery. The mop itself comes with a removable microfiber cloth bottom that can be tossed into the washing machine as needed and then replaced for more cleaning. Behind the microfiber cloth is an additional scrubber brush that you can angle down with your foot for those extra stubborn stains. Simply go over any hard-to-clean areas first with the scrubber and then follow it with the steamer. ​The lift-off handheld is mainly the water reservoir tank and an end for attachments. This particular steamer comes with thirteen attachments for you to use around the house. There is a grout tool, a various scrub brushes, an extension hose, a window squeegee, a fabric steamer, a scraping tool, and an angled tool for those hard-to-clean areas. A small bag is also included to keep all the attachments together. The Bissell Powerfresh Steam Mop offers a high or low setting so you can customize your cleaning to best fit each surface. As an added bonus you can purchase and use Odor Eliminating Fragrance Discs to add an extra layer of freshness to your cleaning routine. ​Not only is this mop versatile, it's also powerful. With 2 steam settings and 13 attachments, the possibilities are endless. Cut the cord and choose an easier way to clean with the ​Bona Stone, Tile & Laminate Spray Mop. This simple and easy-to-use mop is perfect to keep around the house to make your everyday cleaning a complete breeze. The mop has a removable microfiber pad you can rinse after use or toss it in the washing machine to get off any stubborn dirt and grime. A built in reservoir tank is ideal for using your favorite Bona Tile Cleaner on your floors. Or, you can mix up your own natural cleaning solution with white vinegar. The cleaning spray comes out of the bottom of the mop’s spine, just above where the microfiber pad is. When the trigger at the top is squeezed by your hand, the cleaner will be misted out of the lower area. The mist is enough to coat your floors without over-saturating them and making an even bigger mess. The mop easily glides across the floor thanks to a swivel action head. It can execute smooth turns and get into those hard-to-reach corners. You will also avoid scratching or marking up your furniture thanks to rubberized corners on the mop’s bottom. ​These flexible corners will keep your baseboards and furniture legs damage free as you mop. ​It's swivel action head and large base plate for ​coverage ​scratches only the ​surface-- finish ​faster and easier with this Bona Spray Mop. Treat yourself to the best of both worlds when you choose the ​Bissell 1806C Powerfresh Deluxe Steam Mop. This mop and detachable super scrubber is a combo that will make cleaning your floors easier. The steam mop comes with a removable microfiber pad that is machine washable and easy to remove or replace as needed. You can choose to boost the clean room smell by adding a fragrance disc into the top of the mop’s base for a light scent or inside of the microfiber pad for a stronger clean scent..
​The lift-off scrub brush is a great way for you to scrub without getting down on your hands and knees to do so. This spot-boost brush is located just a few inches above the head of the steam mop. When you detach and use it alone, you still have most of the regular mop’s height. A rounded bristle head allows you to clean large areas of stubborn stains. The small bristles allow you focus in on those small pathways, like between tile into the grout. Also included is a spouted cup that makes filling the water reservoir tank easy and helps keep you from spilling water. This deluxe steam mop is 12 amps in power and has a cord that is 25 feet long. You can also choose between having a high steam cleaning or adjust it to a lower steam flow for more water sensitive surfaces. ​The lower steam option also allows this steam mop to clean for a longer time over the high steam option. ​Not only does this​ mop clean well, it also makes the floor smell well-cleaned. All this and more with the Bissell Powerfresh Deluxe. There is a reason why the traditional mop is still a staple in most homes instead of choosing a fancier mop or a steam infused option. The ​O-Cedar Easy Wring Spin Mop and Bucket System will remind you of the powerful cleaning a simple mop can do. This updated take on your grandmother’s mop is simple to clean with and easy to learn how to handle. Included is an oval shaped bucket. In one chamber you add in your cleaning solution. The other chamber is part of the main feature this mop offers. Instead of having to use extreme force to squeeze out excess water or wring it between two bars, this mop comes with it’s own grated spinning chamber. ​Simply place the head of the mop deep into the spinning chamber and use your foot to pump the pedestal. The excess water will be twisted out by force and will drain into the second lower chamber. The mop’s head is made from thick microfiber bristles. These are twisted into shorter and more uniformed mop’s threads than that of its olden day predecessor. The microfiber bristles are super soft and are able to not only grab dirt and dust, but will also hold onto the particles until shaken or washed out. ​The head of the mop has a corner friendly front that makes getting into tight spaces and cleaning the corner of a room much easier. The rest of the body goes from the corner into a square body that allows you to cover plenty of ground. ​One of a kind and easy to wring, this mops is great for quick and efficient cleaning. A easy-to-swivel design and corner-friendly body make the ​Dirt Devil Steam Mop 3-in-1 Versa Steam Cleaner commander of clean, while maintaining a very affordable price. This is because it offers the best feature of steam without any extra bells and whistles. The mop’s head is triangle in shape. This corner-friendly front and straight sides allows you to get close when you are cleaning along a wall or baseboard. It is super easy to maneuver around and turns with a simple application of pressure in one direction or the other. The microfiber pad on the bottom of this steam mop is easy to remove for rinsing or tossing into the washer after a large day of steam cleaning. ​A main tank on the mop’s spine is able to be lifted off to take your cleaning off the floor and around the house. There is a steam tip that pushes out a very concentrated stream, so you can blast away any countertop or stove stains without having to scrub hard. Also included with this mop is a carpet gliding attachment that allows you to go over your carpets to give them a refreshing steam clean treatment. ​The reservoir tank is really easy to tilt and fill with either your faucet or a spouted cup. It has a rubberized seal that keep the water in and deters any leaks as you are cleaning. ​This swivel-steer mop's ​​carpet steaming capabilities and handheld option are ​more than what you bargain for in a traditional mop. Try it now. In the end, the answer is clear for us. ​The Bissell Powerfresh Pet Steam Mop is the best overall option for cleaning your tile and grout along with almost every surface in your home. The included 13 attachments will go a long way in making your cleaning routine easier and more versatile. ​Whether you have a pet or not, this steam mop is top of the line in ease of use and effective cleaning. There are are many different types of mops you can choose from. You may prefer something simple like the one your grandmother used. Or, you may realize the value in owning an all-in-one type mop you can take from room to room and use on multiple surfaces, ultimately simplifying your life. Take a closer look at some of these mops to see which one fits into your idea of the best mop for cleaning tile floors. A steam mop is a plugged-in device that is powered by heating up water to the point of turning it to steam. These electric powered mops are great for forcing hot, moist air onto your surfaces to kill bacteria, blast away dirt, and loosen tough stains. Steam mops tend to be more expensive than traditional mops. This is because of the added electrical feature and the added versatility of a lift off and optional attachments to help you tackle more than just floors. However, they also do a fantastic job of cleaning your floors, and are generally safe for all surfaces, including hardwood and laminate flooring. You have to be careful not to let too much moisture onto sensitive surfaces like bare wood, but if you're cautious then you'll be just fine. This style mop is the tried and true version that households and cleaners around the world have relied on for many years. Many updates to the basic model have occurred, making mopping less of a strenuous job. There is no doubting that a traditional mop can get the job done. The upsides of a traditional map are its simplicity. However, this is also its largest drawback. You aren't able to harness some of the newer technological improvements. It can take longer to clean with a traditional style mop, but it also doesn't have nearly as many parts that could break. Spin mops were created to give you an easier way to wring out your mops instead of having to apply tense arm pressure. In essence, they are nothing more than a takeoff, or advanced version, of a traditional mop. For a spin mop, all you need to do is set the circular mop inside of the grated chamber that rests above the water and give the outside pedestal a few pumps. This will quickly spin the mop head round and round, forcing excess water to fly out and into the bucket without spilling or dripping over your floor. Almost all spin mops will come with a special compatible bucket that houses the spinner. If you're looking for an easy mopping solution for your tile flooring, we'd recommend a spin mop over a traditional mop. A padded mop is one that had a simple base pad that is removable for cleaning or replacing. There are a few different materials the mop pad will be made from. The material will depend on whether you can machine wash it or you need to toss it. Use a fresh and clean pad every single time when you opt for disposable cleaning pads. These throw-away kinds of pads add that super easy, clean-and-toss action to your cleaning routine. But, it can be costly in the long run depending on how much a throw-away pad can hold and how much of an area you need to cover. A microfiber-based, reusable pad is a more eco-friendly choice since you keep and reuse the same pad. The only issue is, you need to remove it for regular cleaning to make sure you aren’t using a dirty pad to try and clean your floors. You may also need to purchase a replacement pad after so long, as it will stain and eventually break down. A sponge based mop is one of the cheaper models that offers an easy way to squeeze out water and scrub due to its abrasive, yet soft, sponge material. A sponge mop traditionally offers a medium to smaller head for a more focused cleaning. However, this style rarely offers any added features nor does it have a swivel head. You will probably be working harder when using it. We don't recommend this style of mop for your home. When it comes to finding the ​top tile floor mop​, it all depends on how much work you want your mop to do, and how clean you need to get the surface. Some grout and tile mops are quick and easy to use, but don't do a great job on deep cleaning. They might be cheap, but the lack the ability to tackle tricky tough situations. On the other hand, more expensive options that harness steam power to deep clean your tile and porcelain flooring will do a much better and more thorough job, but will set you back a little bit more money. We've discussed the different types of mops that you can choose from. Now, take a look at the different features that can be offered in the various models and see which ones you would benefit from. ​Unless you are mopping a large open space with no furniture or obstacles, you will want a mop that offers a swiveling head. This makes turns and angles very easy to achieve as you are driving the mop with only one hand. Older and more traditional mops lack the swivel head. This forces you to use two hands to turn or to mop in a figure eight pattern to keep the head in a wide swiveling motion while cleaning. Also, if you are not into an advance cleaning system, a simple mop will be just what you need. Included attachments and extra features are great if that is something you see yourself being able and willing to use. ​The built in cleaner chamber refers to more simple mops, not the steam ones. It also refers to what they can hold. Instead of having to submerge your mop into a bucket of cleaning solution, these mops have a reservoir chamber that is meant to hold a cleaning solution. When cleaning, all you need to do is give the trigger (usually located on the top of the arm for ease) a few squeezes to have your cleaner mist out over the floor. You can then take the mop and go over it a few times. Spray as little or as much as you need. With these cleaning reservoirs you can opt to use a branded cleaner or get creative and mix up your own cleaner using vinegar to help cut through any tough dirt or grime on carpets or floors. ​Many households believe steam cleaning is the only way to mop. This is because you don’t need additional cleaners or chemicals when mopping. In a steam mop, the water is heated to a high level and becomes steam. Steam alone has the ability to kill 99.9% of germs, bacteria, and dust mites. This means you are not only lifting the dirt, you are also sanitizing your floors. The lack of an additional cleaner also makes this a safer cleaning around kids and pets. Just make sure they stay away from the mop while you are cleaning as steam is very hot. ​Most steamers will offer various steam settings. While your steam mop may run for longer periods of time on a lower setting, this isn’t always the best option depending on the job. The low steam function is in place specifically for unsealed or wood floors. This allows you to steam clean your more vulnerable surfaces while keeping them from becoming too drenched. Related: Tile vs Hardwood vs Laminate Flooring: Which Type is Best for You? For tiles, most fabrics, and carpet you can feel free to use a higher steam setting to really blast away dirt and bacteria. Of course the high versus low settings are up to you. Use the setting you feel gives the best clean for your home. ​Pouring any type of cleaner into a steam mop reservoir is a big no-no. The only thing you will want to add in there is water. Other harsh chemicals or soaps will damage your steam cleaner and could possibly clog it to the point of no return. That said, there is one single thing you can pour into a steam cleaner instead of straight water. But, it isn’t for cleaning your floor-- a natural mixture. You can pour a half and half mixture of white vinegar and water into the reservoir tank. This allows you to clean your steam mop by decalcifying the water tank and steam lines. You should strive to clean your tank about once every month or so depending on how hard your water is. Mineral buildup can happen pretty quickly if you have hard water. This limits the amount of steam that is able to flow through. ​Microfiber is a popular material for mop heads. This is because it is compiled of millions of microfibers that penetrate into small areas and grab dust, trapping it between the fibers and not letting go. The downside of microfibers is that they are not easy to rinse out. After so many uses, you will need to thoroughly clean or machine wash this cloth to make sure all the trapped dust and dirt is out. ​The durability of a mop is tied to its life. Think about how much mopping you do on a daily and weekly basis and how much area you will be covering. If it is a daily chore over multiple large rooms, you will want to invest in a higher quality mop. For small weekly mopping tasks that only cover 1-2 medium sized rooms you can feel more confident choosing a simpler model. ​As always, you will get what you pay for. This is the case when you are looking for the best mop for tile floors and grout. If a mop is priced much lower than its competitors, take a moment to look into it a little more. Check out a few reviews to see why it is more of a bargain. You also don’t need to go after the higher priced models thinking you are getting the best of the best. That is not always the case. The best way to find a good price for a mop is to find the mean or average. The going average for a decent mop that is steam based in cleaning is about $75-$85. Knowing a base range like that allows you to focus in on your goal price. Then, you can compare it with how much you are willing to spend. ​If you are looking to upgrade your mop to something better or if you are searching for a mop that will better cater to what you need, you should take a few minutes to read some reviews on your top candidates. This will give you a multiple layer vision of what you are buying and it’s capabilities versus limitations. Just be aware there are paid reviews. Some of these tend to float to the top of the review list. To give yourself the best overall opinion of the best mop for tile floors and grout is to look up a few of the lower star reviews. Some of them are from defective models. But, a few could give you a better insight to how the mop holds up and how it performs after a few uses. ​Tile floors and grout represent a unique set of circumstances for cleaning. 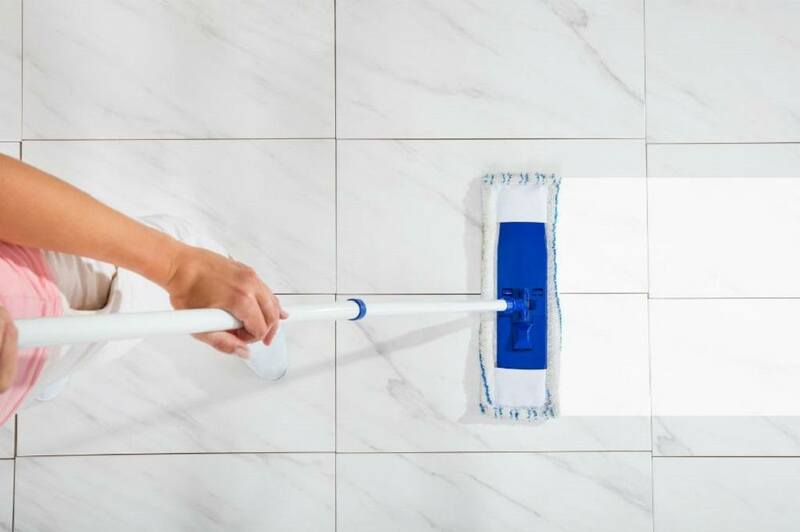 Unlike laminate or hardwood flooring, tile and grout are incredibly resistant to water and moisture, making them the perfect candate for a specific type of mop to use when cleaning. In the end, we highly recommend you opt for a steam mop designed for cleaning grout and tile. You'll be able to harness the power fo steam cleaning to get your floors vibrantly bright and shiny.